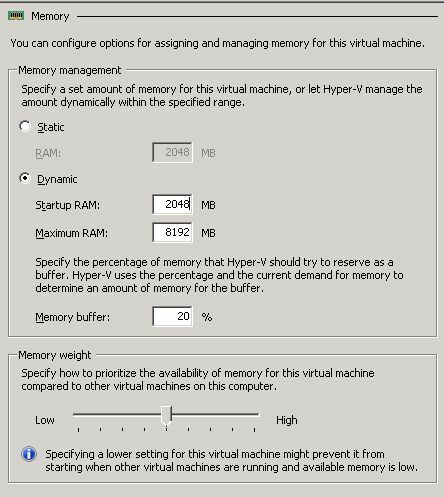 In the Hyper-V console you can find a few options regarding the virtual hardware of each vm and there are several nice features you all should know about. Let’s begin with synthetic and emulated devices. Emulated devices (aka legacy devices) are the more traditional virtual hardware which is supported by pretty much any OS out of the box. It still uses CPU cycles on the host to emulate a hardware and transfer its I/O. The synthetic devices (aka Enlightened devices) are new virtual hardware designed to be much more efficient on virutal machines than emulated devices. It performs way better as it transfers I/O directly to the vmbus instead of emulating a device in between, but the operating system needs the Hyper-V integration software to detect synthetic devices. In short, emulated has better compatibility but synthetic gives better performance. This explaines why the harddrive containing the OS in a vm must be an IDE drive. IDE drives in Hyper-V are emulated at boot, but can transition seamlessly into synthetic devices. SCSI controllers are synthetic only and is therefore not visible for the guest OS until the Hyper-V drivers has been loaded. In performance there are no practical difference between an IDE drive and a SCSI drive in Hyper-V, but you can hot-add disks on the SCSI controller. While we’re on virtual hard drives. The VHD files can be set up in 3 different ways in Hyper-V: Fixed size, dynamically expanding, and differencing disks. A fixed size VHD will allocate all space when the file is created, so if you create a 50GB fixed size VHD the files will be 50GB in size even if it only conaints “free space”. The advantages is that this file will unlikely be fragmented and perform slightly better than dynamically expanding disks. Fixed size disks are recommended for production environments. The obvious downside is that you always will allocate space which isn’t spent. Dynamically expanding on the other hand will only allocate the space which is used by data inside it, and allows you to utilize the storage capasity much better. Though these drives doesn’t perform as well as fixed drives since it has to spend disk writes to expand the file when data is added. Also you will likely end up with defragmented VHD files. But for testing purposes this is a very good option to increase what’s called the “vm density” (I smell a later blog post about that). Just be very careful that the VHD files has space to grow or you risk bringing all your vm down all of a sudden when your physical drive has no space for growth. Differencing disks is that you set up a “parent disk” and then create other “child disks” that uses the parent as a reference. All changes from parent disks are stored in the children. This configuration is seldom used for other than testing purposes as failure on the parent disk will make all children disks unusable. In addition we have pass-through disks which connects a volume directly to the vm and not as a vhd-file. This gives by far the best performance, but the disk is completely assigned that particular vm and can’t be accessed by any other vm or the host. RemoteFX is a new feature in Windows Server 2008 R2 Service Pack 1. It is a virtual display adapter that enables what Microsoft calls “Rich desktop experience”, which means high-end graphics in a vm and over RDP. The graphics are virtulized in the display adapter. This requires support in the graphics driver and you’ll usually need an enterprise version display adapter from Nvidia or ATI. The amount of memory assigned to a vm can either be static, or as of Windows Server 2008 R2 SP1 it can be dynamic. By selecting dynamic memory you can assign amout of memory the vm shall have at boot, and the maximum amount of memory it can allocate. There is also a slidebar used to determine the priority the vm has when several vms has to assign memory between themselves. CPU Cores is prettystraightforward. It is the amout of logical CPU cores the vm has installed. I’ll come back to about the pros and cons of assigning a vm one or more cpu cores. 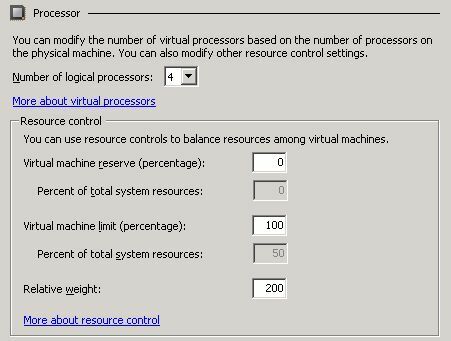 Here you can also reserve CPU power to the vm so it’s guaranteed some resources, and you can also limit the amount of CPU power by percentage the vm can load the host with.